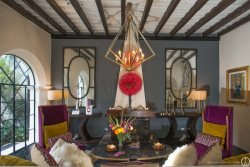 Casa Alta Vista - the name says it all. The Highest view of San Miguel de Allende! This beautiful 6 bedroom house, as a pool with a view. 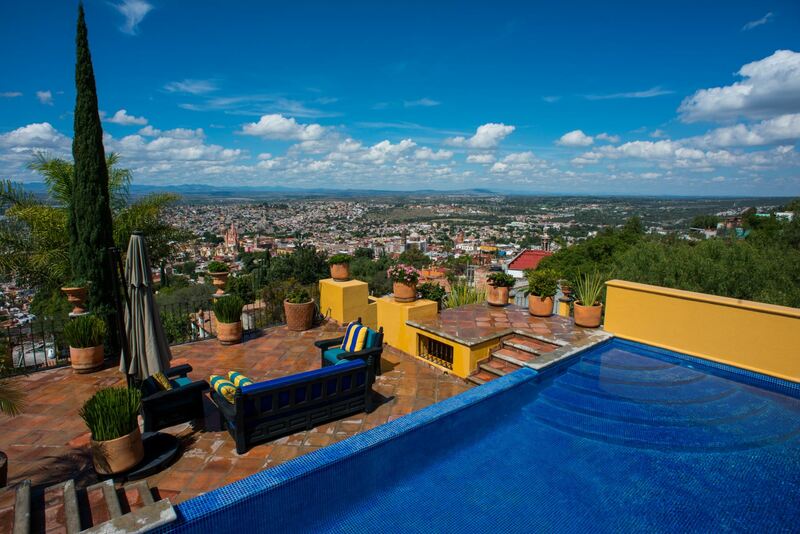 There are 3 different terraces where you can soak up the beautiful views of San Miguel. The main house has three master suites - All have king size beds with their own ensuite bathrooms. The main house, has a den off the kitchen, a great dining room with a view off the terrace, and a formal living space. The terrace on this first level also has outside dining table with chairs, and great places to lounge around. The first bedroom is on this main floor. The second bedroom is on the second floor than the stairs lead to the third level, where you will find a rooftop pool. The views are over the top! The third bedroom is on the garden level that faces the garden. There is a walking path in front that leads to the guest house, where you will find another master suite with it's own terrace with views of the city skyline. The second floor of the casita has 2 more bedrooms, one of the rooms has a King bed that shares a bathroom with another bedroom - this is a great room for parents with kids, since these two share a bathroom. The second bedroom in the casita has a Queen bed and it's own bathroom. There is also a day bed in this room. The casita has a den area, dining and kitchen space. The casita faces the salida a Queretaro. The casita is a great space for kids or teenagers. There is a staff of 4 in the house, with 2 maids, a cook, and a gardner. They are there 6 days a week. M-F 9am-3pm, and Saturday 9-12. To heat the pool is an extra charge, please ask the rental agent for the price to heat the pool. There is also a small capilla on the property, which would be a beautiful place to host a small wedding. Please ask agent for pricing info. If you need to see more photos please ask, and we can send them to you!